The last couple of months I'm working on a renovation at my mother's craft/sewing room. Sometime, eventually, I'm going to post the whole process and final look. Until then I'll share a series of DIYs I'm doing in this room. 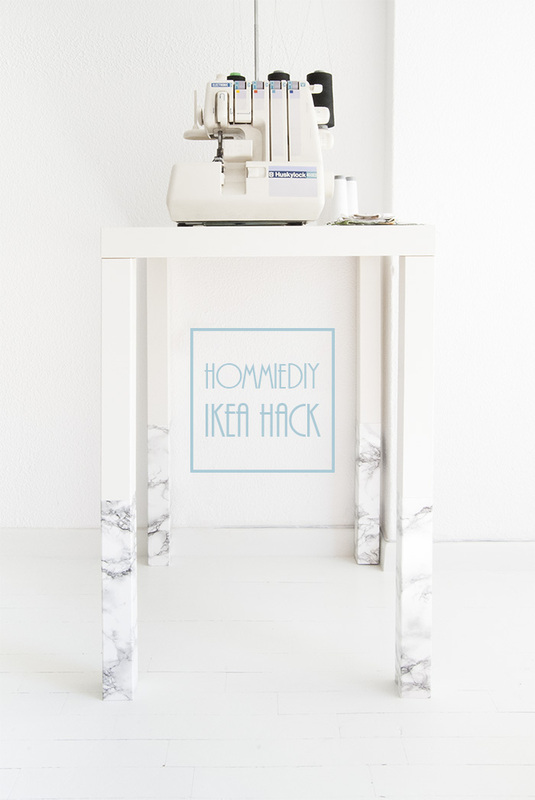 Today's post is about an IKEA Hack DIY. My mother wanted a new table for her overlocker, but she needed to be taller than an average table. I was looking for something small in size, tall, cheap and stylish. The NIPEN legs that I really liked from IKEA were quite expensive for my budget and the table tops I found were too big for what I was looking. 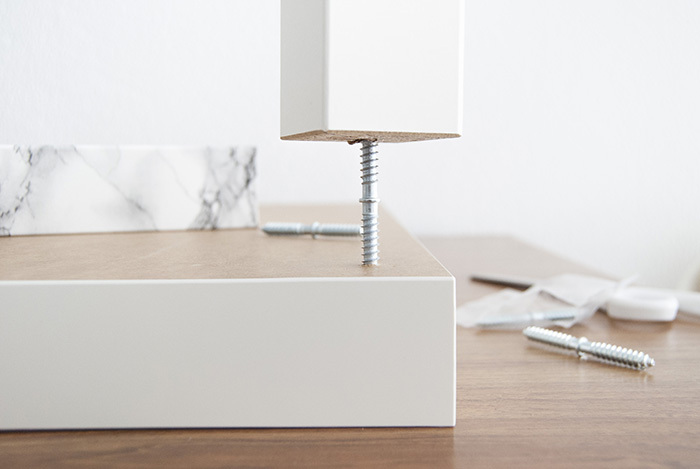 The LACK side table was perfect in terms of size, budget and style but it was short. What about assembling two LACK side tables? ; I thought! It's still cheaper that any other table I had in mind. This idea gave me the opportunity to experiment on my favourite dip-dye trend. 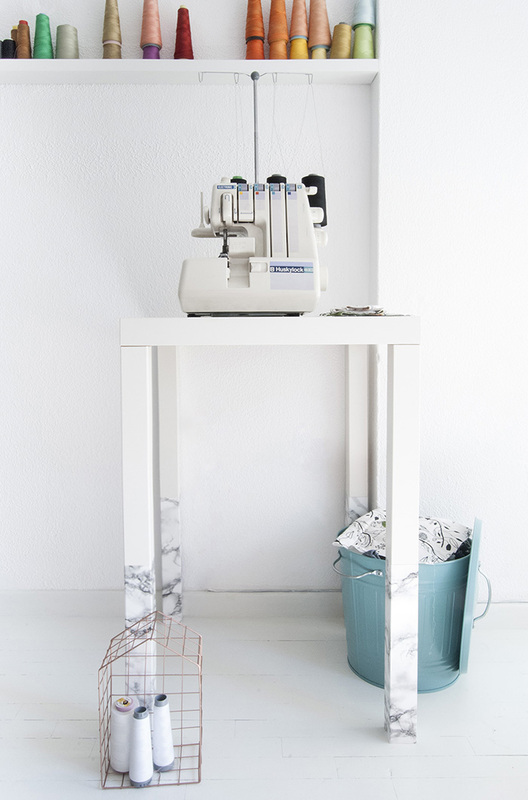 As marble is popular right now, I chose to have a marbled dip-dye tall LACK table. First, take four of the legs and mark an X with a pencil on the underside (the side that isn't drilled), from one corner to the opposite. In this way you'll find the exact centre of the leg. Next, drill with a 4.5mm drill bit where the two lines meet (on the centre of the X). Note that these sides of the legs you drilled are going to be assembled on the table top. The four remaining legs will be covered with the marble contact paper. 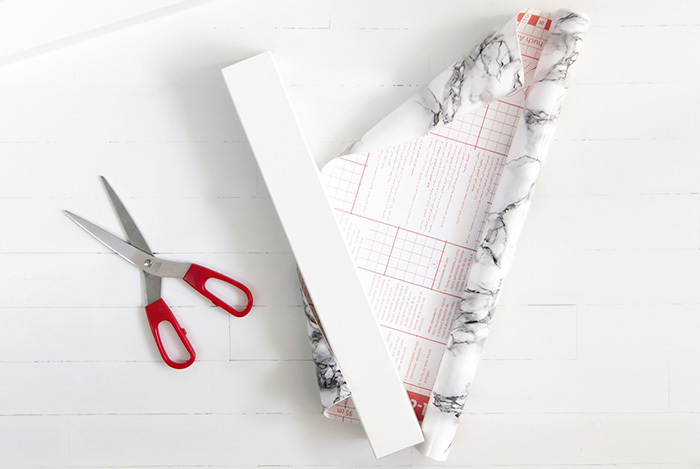 Cut the contact paper to be slightly longer than the leg. Slowly and carefully apply the contact paper around the leg, starting from one edge. Press firmly with a ruler as you go to smooth out any air bubbles. Fold the remaining paper on the sides. It's like wrapping a present! 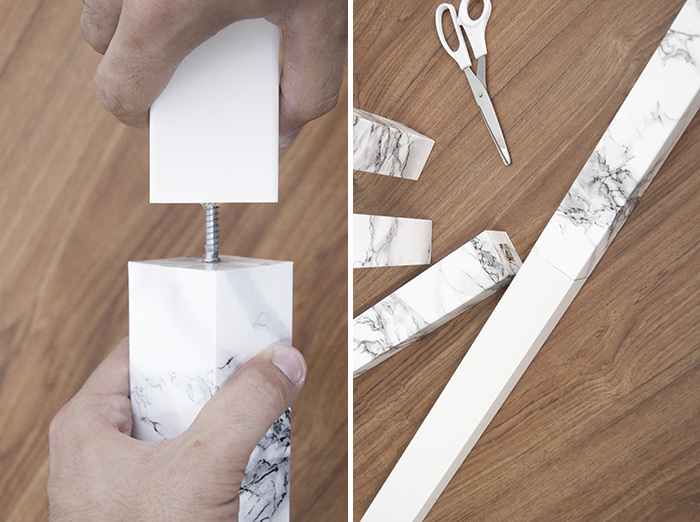 Assemble each 'marble' leg with a white one using the screws of the package. Just connect each side of the screw with the holes on the legs and turn around until the two legs be attached. Then, assemble the four 'new' legs on the table top, according the IKEA instructions that it comes with. I think it came up pretty nice! I'm very pleased with the result! I'd love to hear your opinion and comments! 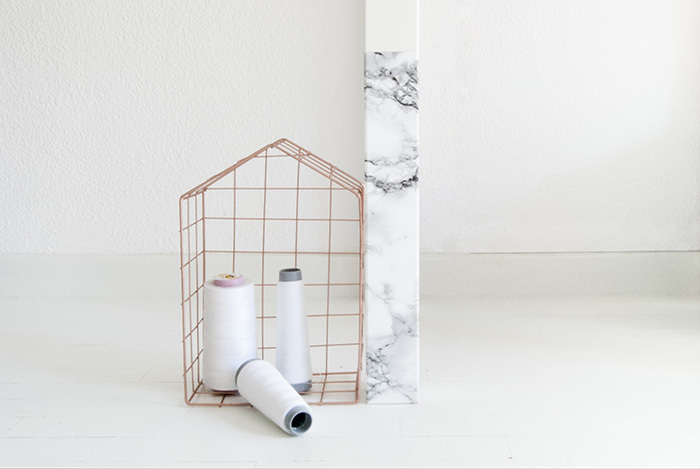 Just an extra tip: LACK side table comes in many colours. According to your taste and personal style you can combine different colours. For example, my second choice was to use the oak legs instead of the 'marbled' ones. Be creative! For articles like this, I like to thank you for the very satisfying results in this article.